Can the Cable Cowboy Wrangle the Debt for His Latest Deal? (Bloomberg Opinion) -- If anyone can make this deal work, it’s debt king John Malone. The billionaire chairman of Liberty Global Plc. is engineering a takeover of Millicom International Cellular SA by Liberty Latin America Ltd., the unit that he spun out last year. While a bid looks a stretch at first glance given Liberty Latin America’s indebtedness, a closer examination shows the financing is just about feasible. 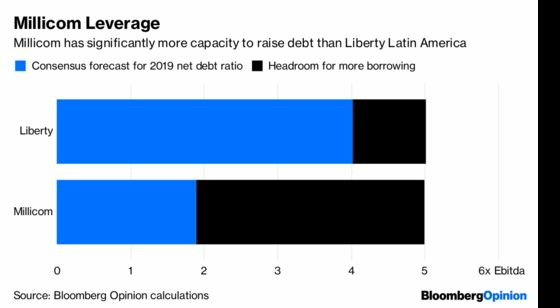 Millicom is carrying significantly less debt than Liberty. That gives Malone the opportunity to lean on the target’s balance sheet strength to fund a hefty chunk of the deal. An offer at a 25 percent premium to the past three months’ average share price would value Millicom at about $12 billion, including assumed net debt. As things stand, Millicom is forecast to have net debt equating to 1.9 times Ebitda at the end of 2019. It could just about sustain net borrowings of 5 times, implying around $7.5 billion of extra debt capacity. That would leave $4 billion of equity to find. Malone has ways to plug the gap. With Liberty’s earnings set to expand over the next year, it also has headroom to seek more financing as its debt ratio declines. It could offer some stock as part of a bid — some Millicom shareholders might welcome the chance to maintain exposure to Latin America. What’s more, the prospect of divestments in Africa, which Millicom has been touting for several years and could top $1 billion, might take the edge off some of the debt pain. The great imponderable is the role of Kinnevik AB, the Swedish investor that owns 40 percent of Millicom. Cristina Stenbeck, Kinnevik’s biggest shareholder, told the Financial Times in 2017 that she was trying to focus the firm more keenly on Europe and Scandinavia in particular. That suggests she would be open to such an exit, particularly since selling the shares on the open market would drag down the stock price. A spokesman told Bloomberg News that Kinnevik would evaluate the terms of any offer. The concern for Millicom investors might be that the likelihood of a bidding war seems slim. Strategically, Liberty is the most obvious tie-up. 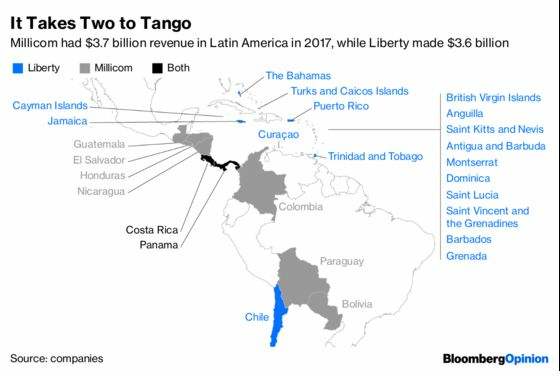 While there is crossover in markets such as Panama and Costa Rica, the footprint is broadly complementary, with Liberty focusing on the Caribbean and Millicom on Central and South America. Evercore ISI analysts said that Liberty’s undersea network could help reduce Millicom’s costs. And the combined purchasing power would be advantageous as the industry heads into the 5G network investment cycle. But that also suggests the Liberty bid might be opportunistic. Millicom is still growing at a healthy clip. RBC Capital Markets analyst Julio Arciniegas expects Millicom’s net profit to jump to $741 million in 2022, up from the consensus estimate of $186 million for 2018. If Millicom, whose CEO Mauricio Ramos used to lead Liberty Latin America, can’t get an auction going, its defense will depend on making the standalone case. And being ready to say no to his former boss if the offer isn’t up to scratch.